How many different types of Computer Assisted Review (“CAR”) software are there? 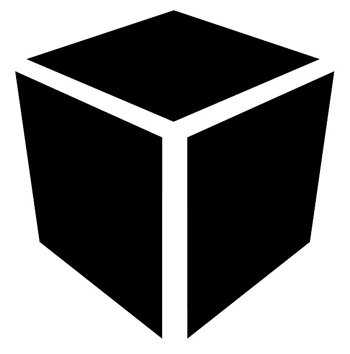 How do their secret black box search engines work? What are the most effective types of search software available today? I need to shed some light on these questions as a predicate for a discussion of the next stage of the predictive coding debate. As I said in New Developments in Advanced Legal Search: the emergence of the “Multimodal Single-SME” approach, the next stage of the debate is not whether to use a CAR, or how much disclosure you should make, but which CAR, and, most important of all, how to drive the CAR. This blog will start with a list of nine popular types of advanced search algorithms that Herb Roitblat compiled recently for an article he is working on. Herb has allowed me to share that list here. The list is not exhaustive, by any means, and slightly new variants are being developed everyday. Next I will share information given to me from one of, if not The top information scientist in the world who is working on legal search, Doug Oard. Doug is a Professor in the College of Information Studies and the Institute for Advanced Computer Studies at the University of Maryland. Dr. Oard is also an active researcher. See his list of research projects here, which includes the TREC Legal Search Track that he co-founded with Jason R. Baron and David Lewis. Jason also tells me that Doug is also an excellent pilot. The different search types on Herb’s list are from different levels. For that reason it is somewhat confusing to present them out of context, flattened out, so to speak, into a mere linear list, when they actually exist in a four-dimensional space with each other. Still, lists such as the one Herb Roitblat has prepared provide a very useful reference to see where vendors are placing an emphasis in the systems they design. For an example of what I mean, the first search type on Herb’s list, Latent Semantic Analysis, is a second-layer type of system module. Second layer type modules transform feature sets that have already been constructed by first layer type decisions. Doug explained that second level types “squash a data universe into one direction” for use by a third level Classifier Design type of code. Second level type protocols do not actually make classification suggestions, such a relevant or not, they only create a space for other software programs to make that call, the classifier systems. To continue with the example, the second-level Latent Semantic Analysis could be used with a third-level classifier design module such as a Support Vector Machine or Nearest Neighbor Classifier for retrieval to happen. Latent Semantic Analysis alone can do nothing unless and until a classifier works in the space it created. For that reason it is not too helpful to say your software uses Latent Semantic Analysis unless you also specify what classifier engine you used. Bottom line, although Herb’s list is an interesting place to start, and provides a good indicator of vendor emphasis, a full evaluation of search software requires a more complex, four-dimensional analysis of search features and their interactions. Doug Oard allowed me to examine a manuscript he has nearly completed, Information Retrieval for E-Discovery. He is writing this information science survey with his colleague William Webber, whom I have referred to and quoted on this blog many times before. Doug and William explain in their manuscript the key search features that engineers use to improve search efficiency. I will share the highlights here, which Doug graciously examined and corrected for accuracy, although the opinions and any errors are all mine. First, the promised list from the generally jovial Herb Roitblat, whom I like to kid by calling the Borg King. It is a dubious accolade that he takes with a laugh. 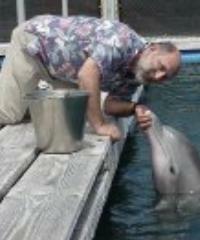 Dr. Roitblat is a research scientist with a background in psychology who, like me, loves dolphins. 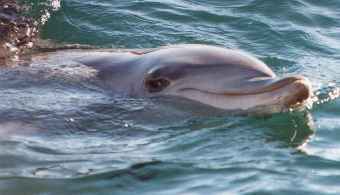 Before tuning his attention exclusively to legal search over ten years ago Dr. Roitblat did research in the fields of language acquisition, cognitive science, dolphin biosonar and cognition. He also served as a Professor at the University of Hawaii for seventeen years, where he got to know my brother, George Losey, a Professor of Marine Biology at the same University for over thirty years. See Eg. Losey Lab. Herb is also the co-founder and lead scientist of OrcaTec, a legal search software company, so he has some skin in the game. 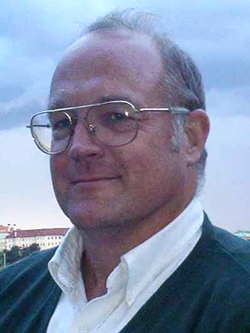 He also serves as the lead scientist of the Electronic Discovery Institute and author of its important study: Roitblat, Kershaw, & Oot, Document categorization in legal electronic discovery: computer classification vs. manual review. Journal of the American Society for Information Science and Technology, 61(1):70–80, 2010. Herb Rotiblat is a frequent contributor to this blog. Also see: An Elusive Dialogue on Legal Search: Part One where the Search Quadrant is Explained, and Part Two on Hybrid Multimodal Quality Controls. We do not agree on everything, but there is no question as to my respect for the mighty Borg King. Here is his list of several of the popular types of legal search algorithms, along with the insertion that I added after the name as to which of the four layers explained by Doug Oard each type belongs to. Latent Semantic Analysis. Feature Set Transformation. A mathematical approach that seeks to summarize the meaning of words by looking at the documents that share those words. LSA builds up a mathematical model of how words are related to documents and lets users take advantage of these computed relations to categorize documents. Probabilistic Latent Semantic Analysis. Feature Set Transformation. A second mathematical approach that seeks to summarize the meaning of words by looking at the documents that share those words. PLSA builds up a mathematical model of how words are related to documents and lets users take advantage of these computed relations to categorize documents. Support Vector Machine. Classifier Design. A mathematical approach that seeks to find a line that separates responsive from non-responsive documents so that, ideally, all of the responsive documents are on one side of the line and all of the non-responsive ones are on the other side. Nearest Neighbor Classifier. Classifier Design. A classification system that categorizes documents by finding an already classified example that is very similar (near) to the document being considered. It gives the new document the same category as the most similar trained example. Active Learning. Methodology. An iterative process that presents for reviewer judgment those documents that are most likely to be misclassified. In conjunction with Support Vector Machines, it presents those documents that are closest to the current position of the separating line. The line is moved if any of the presented documents has been misclassified. Language Modeling. 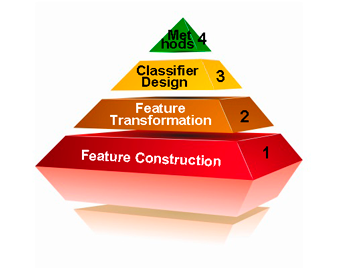 Classifier Design that often presents as a Feature Set Transformation. A mathematical approach that seeks to summarize the meaning of words by looking at how they are used in the set of documents. 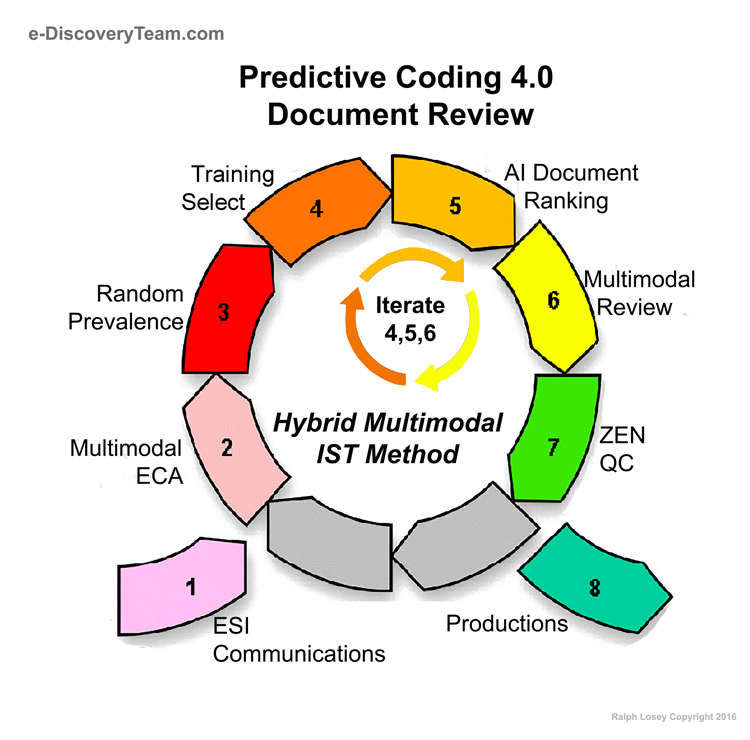 Language modeling in predictive coding builds a model for word occurrence in the responsive and in the non-responsive documents and classifies documents according to the model that best accounts for the words in a document being considered. Relevance Feedback. Methodology. A computational model that adjusts the criteria for implicitly identifying responsive documents following feedback by a knowledgeable user as to which documents are relevant and which are not. Linguistic Analysis. Methodology. Linguists examine responsive and non-responsive documents to derive classification rules that maximize the correct classification of documents. Naïve Bayesian Classifier. Classifier Design. A system that examines the probability that each word in a new document came from the word distribution derived from trained responsive document or from trained non-responsive documents. The system is naïve in the sense that it assumes that all words are independent of one another. 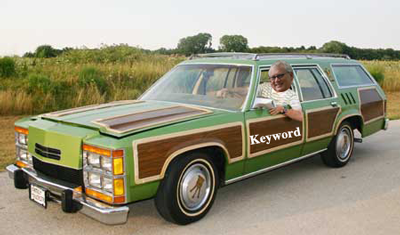 Some software already on the market use other types of search systems not included on Herb’s list. They may be too new or esoteric to have made Herb’s list, which does not mean they are any better (or worse). There are many more that are just slight variations or mere marketing puffery. My only comment on this list is that for me the most important one is Active Learning. If software does not have this feature built in as a planned method of use, then, in my opinion, it is not a bona fide predictvie coding, machine learning, type of CAR (TAR). More on that in another blog perhaps. Information retrieval researchers have long experience with content-based retrieval in which the representation is built from counts of term occurrences in documents, but specialized systems also use other features (e.g., metadata found in library catalogs, the link structure of the Web, or patterns of purchase behavior). Borrowing a term from machine learning, we might call the process of crafting useful features “feature engineering” (Scott and Matwin, 1999). Four broad types of features have been found to be useful in IR generally over the years: content; context; description; and behavior. Content is what is inside the document itself; the remaining three are varieties of metadata. Information Retrieval for E-Discovery, pg. 28. Term weighting calculated to give emphasis to terms frequently appearing in a particular document but rare in the collection. Contextual Metadata. Defined succinctly, contextual metadata is any representation that serves to characterize the context within which some content was generated. … From this discussion, we can identify three broad classes of contextual metadata: time-document associations (e.g., date written), person document associations (e.g., the person who stored an email message), and content relationships (e.g., reply-to relationships). Descriptive Metadata. A broad definition of descriptive metadata is metadata that directly describes, but is not part of (nor automatically generated from), the content of an item. Any form of content-indicative annotation or tag for a document constitutes descriptive metadata. Behavioral Metadata. Behavioral metadata, loosely defined, is any metadata that provides information about how people have interacted with an item after its creation. Examples of behavioral metadata include the most recent time at which a file was accessed (which is maintained by many file systems); the most recent time a document was printed (which is maintained within the document by Microsoft Office products); whether the user had designated for deletion a file that was later recovered from a disk image using forensic techniques; and whether and to whom an email or attachment was forwarded (Martin et al., 2005). Search software designers should keep all four types of search features in mind when designing first-layer type software systems: content search; context metadata search; description metadata search; and behavior metadata search. Designers should also keep all four layers in mind when designing any one layer. They all work together, and you cannot have search without all four. That includes the last layer, how search software is used. That is why vendor usage protocol development and user training is so important. In my opinion, to properly evaluate any search software you should consider how these four features, four layers, were constructed, a process Oard and Webber call feature engineering. My non-technical understanding of their explanation of feature engineering is that, like any kind of design, it is a matter of trade-offs and expense. What are you trying to accomplish? What kind of data will you be searching? Who will be using the software? What combinations of search types do you plan to use in the four layers? What are the pros and cons of any particular combination you use? Good design necessarily requires all four layers to work well together. They are not designed from the ground up, starting with Feature Construction. Doug explained that information retrieval systems are designed by thinking about all of these layers together, a process he calls co-design. [M]ust allow users to specify their retrieval goal in an effectively operationalizable way that ultimately can be made to conform with the representation of the ESI that is to be searched. There are two general forms this specification can take: (1) formulating queries, and (2) providing annotated examples. The two can work together: while example-based classifiers are popular, some way of choosing the initial examples is required. The discussion of specification starts, therefore, with query formulation. Two basic techniques are known for building good queries: “building blocks,” and “pearl growing” (Harter, 1986; Marley and Cochrane, 1981). The “building blocks” approach starts with facet analysis to identify the criteria a relevant document must satisfy. An alternative approach is known as “pearl growing,” the key idea of which is iterative query refinement through the examination of documents. Initial queries are both overly narrow (missing relevant material) and overly broad (including irrelevant material). Learning from Examples. An alternative to retrieval specification using explicit queries is to automatically learn a model from annotated examples using supervised machine learning. Typically, the user interacts with such classifiers by annotating examples of relevant and nonrelevant documents; the classifier then learns which document features (Section 3.3) are predictive of relevance. Both positive and negative examples are necessary to train a classifier. When relevant documents are a relatively small proportion of the collection, however, an insufficient number of positive examples might be obtained by a random sample (Lewis and Gale, 1994). Moreover, a fully automated classifier cannot learn the importance of a feature that it never sees in an example. The query formulation strategies described above (Section 3.4.1) can be useful in locating a sufficiently rich and diverse initial (or “seed”) set of examples. Some e-discovery practitioners, however, prefer to select the seed set by pure random sampling to avoid the (actual or perceived) potential for classifier output to be biased by the choice of query. 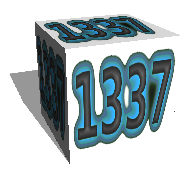 The last reference to some e-discovery practitioners selecting the first round of machine training, the so-called seed set, solely by random, is what I have been calling part of the Borg approach. Random is good to a point, it does help counter any potential bias, but in my opinion both random and judgmental sampling found by queries should be used. It is a mistake to rely on chance alone. It is terribly inefficient, and probably not as effective. (I know, I’ve tried it and will report on that at another time.) 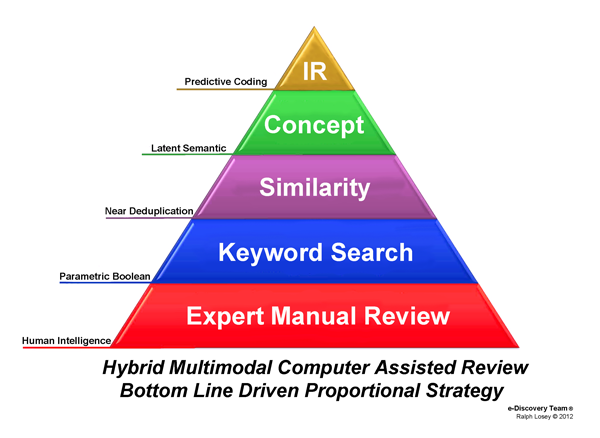 But most importantly, it fails to utilize the most important feature of any legal search, the human brain (what we used to call wetware), which is the foundation for the multimodal search pyramid. The supposition that lawyers are incapable of overcoming a bias to distort the truth, and so their active queries should be kept to a minimum, is a gross exaggeration at best, and a slap in the face of lawyer professionalism at worst. The Borg approach forgets that humans can never be taken out of the picture of legal search. For it is lawyers and judges who define the search target to begin with. We define what we are looking for and judge whether or not it has been located. Relevant or irrelevant may be a binary process, but the reasoning behind it is not. It sometime involves quite complicated legal analysis to determine whether a document is in or out, much less how much weight it should be given, i.e. – is it Hot or not. Brassil et al. (2009) claim that both facet analysis and iterative refinement are central to effective e-discovery. Pearl growing by itself is not particularly good at finding previously unknown aspects of a topic; achieving sufficient diversity therefore requires first applying something like building blocks, and then refining the initial results using something like pearl growing. Classifiers are frequently trained iteratively, by adding more annotated examples until some level of measured reliability is achieved. Examples additional to the initial seed set can be selected by simple random sampling, or else the classifier itself can determine which documents to annotate next, in a process known as active learning. In active learning, it is typically the documents that the classifier is most unsure about classifying that are selected for assessment. Active learning generally requires fewer training examples than random or passive learning (Lewis and Gale, 1994). Iterative training workflows may also include a step where the user is asked to review inconsistent or outlier assessments (O’Neill et al., 2009). The exam of inconsistent categorizations between actual coding and predicted rank is an important quality control that you should also look for in good search software. Clustering: Clustering helps to address cases in which decisions can and should be made on an entire set of documents at once. These may be final decisions (e.g., to mark each document family in a set of exact duplicates as responsive or as not responsive) or they may be intermediate decisions in some staged decision process (e.g., to include all documents held by some custodian). Many classifier designs learn statistical models that are not easily interpreted or directly tunable by people. For instance, a support vector machine learns a separating hyperplane in a transformed multidimensional feature space (Joachims, 1998), while (supervised) probabilistic latent semantic analysis infers a generative model of words and documents from topical classes (Barnett et al., 2009). There are, however, classifier designs that yield decision rules that are at least somewhat interpretable. Examples include rule induction (Stevens, 1993), association rule learning (Agrawal et al., 1996) and decision trees (Quinlan, 1998). Unfortunately, the less explainable statistical text classifiers also tend to be the most effective (Dumais et al., 1998). When the model built by an automated classifier is not easily interpretable, the use of example-based statistical classifiers places a heavy emphasis upon evaluation to guide classifier training and to assure classifier effectiveness. This is an important consideration for me in evaluating a new CAR, have software designers reached a good balance between deep analysis and obvious results in the level three classifiers? I do not want it to be so obscure as to be impossible for an experienced searcher to tune, and know when to stop, yet at the same time I want classifier effectiveness. I want the computer to be able to find types of responsive documents beyond my expectations. Coming up with the right mix is not an easy design process. It takes time and great expense to develop sophisticated legal search algorithms. Although the basic technologies have been known for years, the application to legal search is fairly new. Some companies have understood the importance of investing in these new advanced search methods and features. They have been doing it for years. Other are just now playing catch up and pasting together something, just so they can say they have a CAR with machine training capacities. Which of Herb Rotiblat’s list of nine are in your black box? Any others? How do they fit into Doug Oard’s and William Webber’s four layers? Please try to explain in layman’s language how it operates? If a judge ever insists on hearing about this in a Daubert or less formal type of hearing, who are your designated spokespersons. Can I see their resumes? What kind of investment in this technology have you made, approximate dollar amount? Are you using your own code, or are you licensing someone else’s? If partially outsourced, which parts and why? If outsourced, do other software vendors use the same code? If so, why should I use yours instead of theirs? If you did create your own software, what is your development cycle? What version are you on now? What improvements are you working on now, short-term and long? Can I see the last release notes? What resources do you now have committed to the software enhancement process? How many people and what are their qualifications? What scientific experts, researchers, or engineers have contributed to your software? Do you have any objective or third-party test results and testimonials? References? Can I see all of your White Papers on CAR? 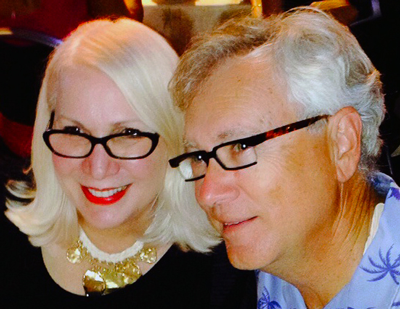 Who would you assign to assist me on predictive coding issues? Who would be my project manager(s)? Length of commitment? Transferability? Refunds if we don’t like it? And most importantly, can I take a test drive of your CAR, one where I do the driving, without vendor passengers (unless I have questions) and have time to see how it works? Do not just pick your CAR on the basis of price alone, or type of algorithms as per Herb’s list, and never select search and review software on the basis of vendor advertising alone. If you do, you may end up with the famous Griswold clunker! This entry was posted on Sunday, March 3rd, 2013 at 8:39 pm and is filed under Review, Search, Technology. You can follow any responses to this entry through the RSS 2.0 feed. Both comments and pings are currently closed. front page and note how they write news headlines to grab viewers interested. You might add a related video or a picture or two to grab readers excited about everything’ve written. In my opinion, it would make your posts a little livelier. expenditures on electricity and water. Issues may come up unexpectedly’new insurance and medical costs, or you may be paying rent or mortgage for the first time.